Bamboo has event space and conference room spaces for rent any day of the week. Bamboo has many creative conference rooms available to rent in Detroit by the half day or full day rental. If you rent one of our conference or meeting rooms you are treated as a guest on us, including full access to kitchen, free Rocket Fiber WiFi, free coffee and tea, printing, office supplies, TVs and projectors, and main common space access. We’ll recommend nearby food and fun for your team too! Workshop Room - Our large meeting groom with a craft wooden table, storage or food setup area, and seating for up to 12 people. Brainstorm Room - Bright creative room surrounded by whiteboards, windows, and comfy lounge furniture. Seating for up to 8. Board Room - This is a traditional board room with TV, whiteboard, and seating for up to 9 people. Looking for a Detroit event space to hold a networking event, training seminar, or creative retreat? The Bamboo Café is available for your next private event in Detroit. Event space rental with us includes seating for around 30-40 people, with casual networking space for up to 75. You’ll have full access to the our kitchen and coffee bar, kitchen supplies, Gigabit Internet, a large television ideal for presentations and talks, high top chairs and tables, flexible lower height tables and chairs as needed. There is a separate entrance making it easy to brand and communicate event locations. All event inquiries must be sent through our event inquiry form! Our team will then follow up to work with you. 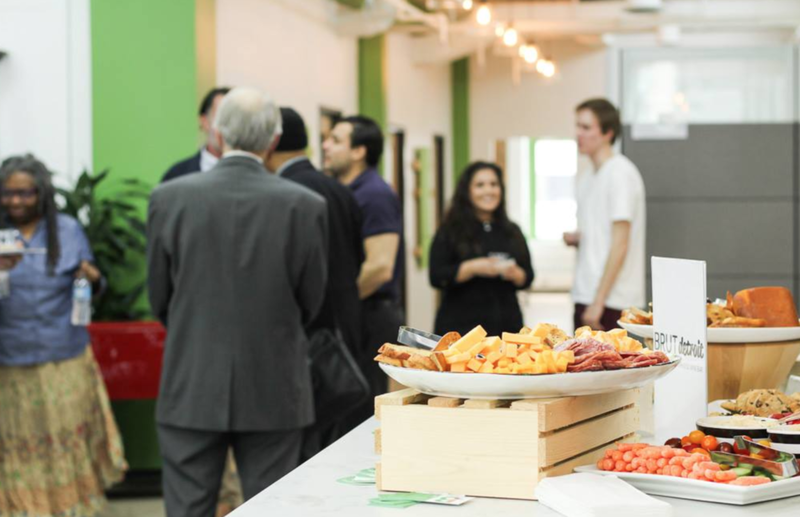 Members have free and unlimited access to using Bamboo’s Detroit conference rooms and meeting spaces. 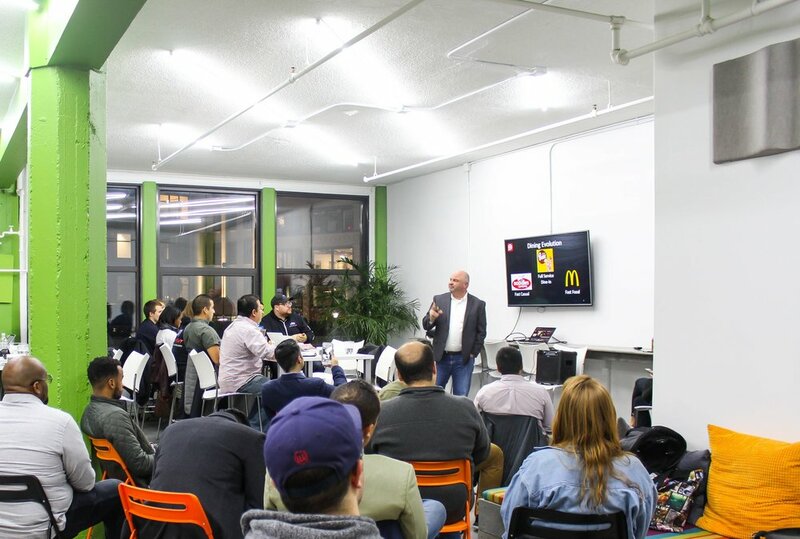 Our Detroit event space is often used as co-working and available on a limited basis for rental. Please see below! Up to one 3 hour credit monthly Cafe weekday evening or weekend usage per month free. Discounted hourly option of $150 / per hour after for members only. *Weekday daytime usage is offered on limited, special case basis, as it is often just for co-working during the day. Note, Fridays are included in weekend pricing. Discounted hourly option of $150 / per hour after for members only. Up to one 3 hour credit Cafe weekday evening or weekend use. Discounted hourly option of $150 / per hour after for members only. Members get three hours per day usage included. Discounted hourly rate of $50 an hour for members only. How do I reserve a conference room? Members can log into to their account anytime for booking conference and meeting rooms. Non-members must fill out our form above providing us date, time, # of people, and room. Payment is required up front for non-members to hold the date. What if I cancel my meeting room reservation? There is no cancellation fee for members. Non-members can cancel up to 3 business days in advance for no fee. How do I reserve the cafe event space? Members and non-members must fill out the form for us above. Can I bring food and or beverages? Yes! We are happy to recommend catering options. Coffee and tea is on the house, and we can recommend other options. How do I use the technology and what is available? All technology is setup to run on our Rocket Fiber Internet. We provide Wi-Fi, TV’s are already setup to go. We also have a speaker and mic that can be used for events requiring presentations. Can I set it up another way? Yes, we are open to you changing the room setup. Setup and tear down is required by all members and non-member rentals. If you do not re-set the space a cleaning fee is applied. I’m done with my meeting, can I hang out for a bit? Yes, make yourself at home for the day. Where do I park or tell guests to park? Parking is available on the streets all day, and you can re-book after time usage. There are free parking options in the nearby casino, and in parking garages and lots all around us. Please view our parking map on our contact page. Our team is happy to help you identify best parking for your event. How can I layout the event space? We’ve seen a variety of creative layouts for the event space. Please review our top event space recommendations for layouts. The Traditional layout is perfect for a 30-40 person class or workshop, or casual event. The kitchen island is often used for food and beverages. The tables have outlets so you can power your devices without leaving your seat. You can easily additional seating with folding chairs too. The U Shape Layout is great for a smaller, more intimate workshop setting for your next event. This may require additional power outlets for seating depending on the type of workshop. The Happy Hour Layout is a great way to turn the high top tables into cocktail tables. You can use a high top table next to the kitchen island for additional beverage and food layout, rent a mobile bar from our building, and leave additional tables and chairs as is or push back against the windows for more movement and standing room feel. This is great for networking and causal events in Detroit.